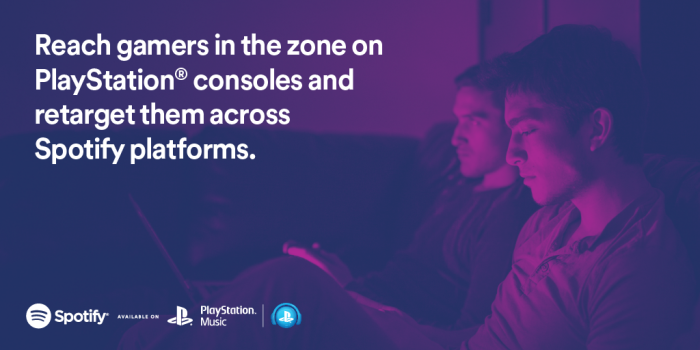 Spotify is reaching out to brands to reach gamers in the zone on PlayStation as it launches the first of many ad solutions to come on the platform. According to the music streaming platform, these new ad formats will enable brands to reach a highly engaged audience on new connected platforms and devices. Currently, Spotify’s partnership with PlayStation Music reached more than 5 million app downloads. PlayStation 4 users globally have been soundtracking their gaming sessions with their favorite music, from a library of over 30 million songs. Brands can reach PlayStation gamers with Spotify in two ways. The first is by targeting the PlayStation platform where brands can reach target audience with audio ads while they’re listening to Spotify on a PlayStation 4 or PlayStation 3 system, verified by first-party data. The second is by retargeting gamers across devices. This allows brands to reach first-party verified PlayStation gamers as they use Spotify across desktop, mobile, and tablet devices. Spotify also revealed that its users on PlayStation have streamed over 1.5 billion tracks to date and are listening an average of 88 minutes per day. Their listening activity over-indexes in the late afternoon to late evening on weekdays, and early afternoon to late evening on weekends. "MYStories Raya 2018" highlights two individuals who have dedicated their lives by helping communities in need especially during t..